Homemade Christmas candy recipes are a wonderful way to make your holiday extra special. Christmas is my favorite time of the year! I SO enjoy making wonderful goodies to share with family and friends. I picked a few of my favorites to share with you and your family. I hope you will love them as much as I do. 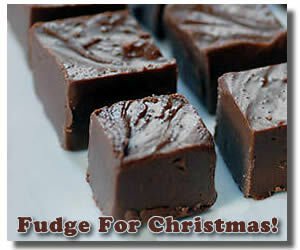 Let's start with a quick and easy fudge recipe. We're not talking "gourmet" here, but it's pretty yummy and so very easy to make that I couldn't resist sharing it with you. Melt chocolate chips and peanut butter over medium heat. Fold in marshmallows and raisins, stirring until marshmallows are melted. Pour into 7x11 pan and chill until firm. Cut into squares. Store in an airtight container in the refrigerator. Another quick, easy, and versatile recipe that will let you prepare a tasty treat that looks a lot harder than it is. If macadamia nuts are not toasted, toast them in a dry skillet until golden. Set aside. Melt white chocolate in a double boiler. Add coconut and macadamia nuts and stir well. Spread mixture on waxed paper. Chill to set, about 30 minutes. Break into pieces. Store in airtight container. *** You can change up this white bark recipe by swapping the macadamia nuts and coconut for other types of nuts, crushed candy canes, raisins, dried cranberries, etc. Create your own unique combination for a personalized Christmas candy tradition. Do you love the sweet, salty, and buttery taste of chocolate covered toffee? I sure do! Cook butter and brown sugar over medium-high heat, stirring constantly until temperature reaches 300 degrees F. on your candy thermometer. Pour into greased 9-inch baking pan. Place chocolate over hot toffee to melt. Spread to make an even layer. Sprinkle chopped pecans over chocolate and press lightly. Chill until firm, approximately 1 hour. Turn out onto waxed paper and break into pieces. Store in airtight container. 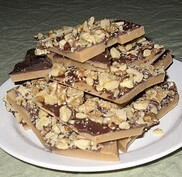 Similar to the toffee recipe above is another Christmas favorite you might remember called Almond Rocca. If you haven't tasted this sweet treat, give it a try. Melt butter in saucepan. Add sugar and cook over medium heat for 5 minutes, stirring frequently. When mixture turns golden brown, add 1/2 cup almonds and stir. Pour mixture onto small baking sheet. Sprinkle chocolate chips on top and spread evenly when melted. Sprinkle remaining almonds on top. Break into pieces when candy is cool and set. Store in airtight container between layers of waxed paper. Those are just a few of my many favorite homemade Christmas candy recipes that I have collected from friends, family, and old cookbooks over the years. If you have a favorite homemade Christmas candy recipe of your own that you would like to share with me and my readers, please add them below!